Like it or not, New England's frigid winter temperatures will be here before long! They often arrive well before the formal start of the winter season, so I'm already doing some inventory in my closet for winter fashion pieces that I'll need, and ways to restyle things that I already have. I recently got this cozy sweater that I'm wearing in today's post, and I know this outfit will be great for any early chilly days that head to Vermont! I had scheduled this blog post for today a few weeks ago... but it is ironic that I'm publishing it on this Monday as Northern Vermont is coming off of a gorgeous weekend filled not only with sunshine, but also 80 degree temperatures!! Let me repeat- two days of 80 degree temps in mid September! That is warmer than it was for a lot of summer here... what a glorious weekend it was! I'll be sharing a bit about what I did to enjoy it in this week's Midweek Ramblings post on Wednesday. Anyways- onto this outfit, which I know sadly I will be wearing sooner rather than later with the way weather changes here! In the winter or cool end of fall, it can be easy to start to get lazy with fashion. Gone are adorable sundresses and fun summer patterned dress pants, and it's onto what can seem like an endless cycle of sweaters. My job is so casual attire-wise that I want to make sure not to fall into the boring 6+ months trap of wearing an oversized sweater, jeans, and snow boots to work everyday! That wouldn't be very fashion blogger of me. I know that the long cold season up here will be a challenge to my fashion sense- but I'm up for it! 😉 My hope is to wear a lot of outfits like this one- looks that are still warm and cozy, but also trendy and cute. This grey sweater is one of the warmest things in my closet right now!! I was pretty hot when shooting this, but I know I'll be so thankful for this once the snow arrives. I highly recommend it if you live in a cold state, or have a ski vacation planned for this winter! My mom surprised me with this pretty plaid scarf this summer which is on sale now!! If you're looking for a great scarf for the upcoming months- grab this one now while it's marked down. And I love these faux leather leggings! I bought them last season and they're back for this year too and fully in stock. Are you already thinking about your cold weather wardrobe like I am? What's on your must-buy list? 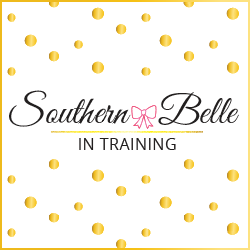 I'm excited for the rest of the month's posts on Southern Belle in Training! Stay tuned for some fun ones on the way, starting tomorrow! Ahh welcome to summer in fl! only we've had days in the 90s and it feels like in he 100s haha I wish we had more time for sweather weather here! I switched out my wardrobe last week and got so excited for sweaters, but it's supposed to be in the 80s here in Cleveland this week! Loving this outfit, though! This sweater is going to be so versatile! We started to get cooler weather last week and then it was high 80s all weekend, which I shouldn't complain about because I hate the actual cold haha. That sweater is so cute on you! 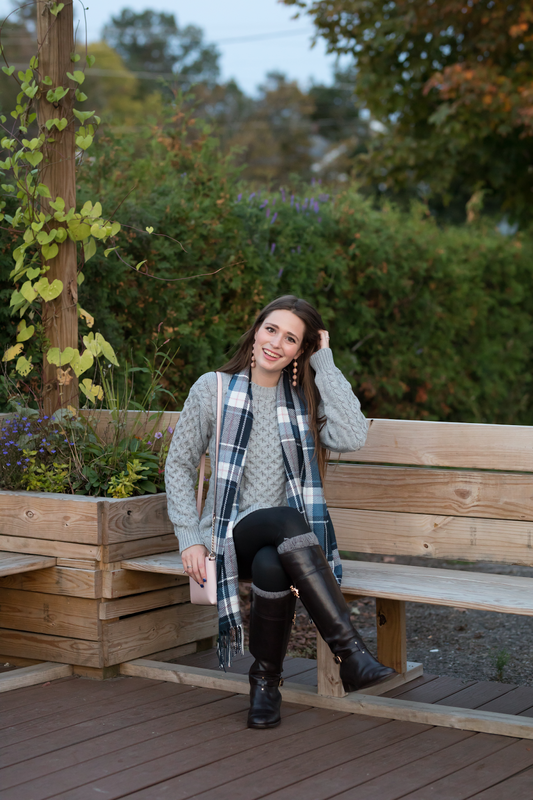 Perfect Fall outfit! Looks great! Love that sweater and scarf! I love this sweater! I cannot believe it was sooo hot today, I had to get my summer clothes back out! I love the plaid scarf! I need to find one for fall! We had a few days in the 90's this month! Like fall?? you okay?? 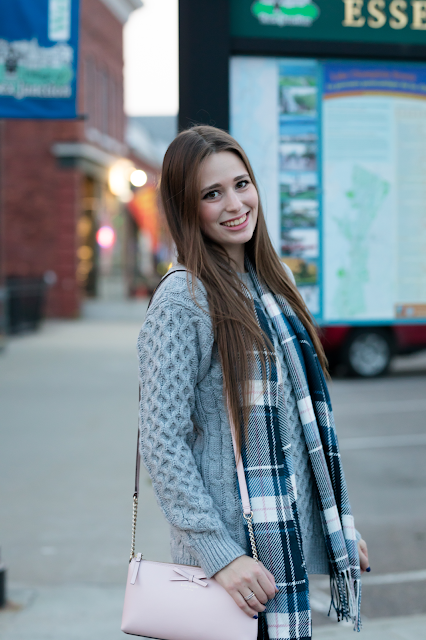 But this is seriously the cutest cozy look for the season! This is seriously the cutest, coziest look ever. I can't wait for temperatures to drop here in NY. Dying to wear something like this. I love the scarf and your sweater looks so cozy and comfortable.